First CF concert in Zurich and my first CF concert ever. November 16th 1986 at the Volkshaus in Zurich. Final concert on the Tragic Serenades Tour. 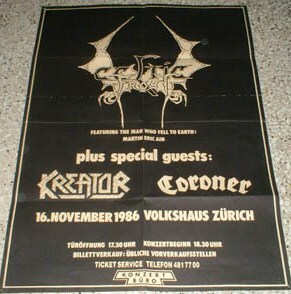 They were different times and word spread so much more slowly back then, but CF played with Voivod on my birthday that year. Sadly, I did not discover this until about a decade ago, when the gig itinerary was posted at the CF website. That would have been something.